The TD-W8960N is the only device you need when you and your roommates want to stream trending YouTube videos in excellent quality. 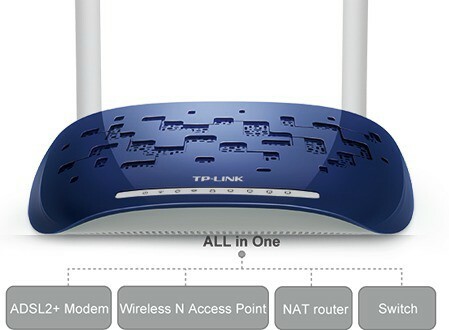 The TD-W8960N is an ADSL2+ modem, 300Mbps wireless N access point and NAT router combined. It comes with a four-port switch too. So, you don't have to buy multiple devices and clutter your desk to access the Internet wirelessly. Compliant with the 802.11n wireless networking standard and featuring four megabit LAN ports, the TD-W8960N is ideal for users who want to stream movies in HD or play online games seamlessly. This device ensures transmission rates of up to 300 Mbps. The TD-W8960N supports ADSL and Ethernet WAN connections too. Use the interchangeable LAN/WAN port to quickly switch to a cable or fibre service from your ADSL connection. The TD-W8960N supports VPN-enabled clients and devices. You can also set-up a new VPN server with it. This feature ensures that non-critical apps don't degrade your network's performance. Press the WPA button to quickly establish a secure network. Use the optimized user interface or set-up wizard to start surfing the Net in no time. This feature allows your guests to access the Wi-Fi safely.